She had long, perfectly manicured fingernails at all times (once, when my stepsister and I both had chipped nail polish, she told us harshly, “If you can’t keep your nail polish presentable, you shouldn’t wear any at all”). When I was about 12 (and weighed approximately 65 pounds), she told my mother that I shouldn’t be allowed to eat desserts or candy, because I was getting fat. My grandmother wasn’t very nice. But she wasn’t all bad. She was funny and had a dry sense of humor, a sideways grin, and a twinkle in her eye. She was smart, sharp, and quick. She had also lived through a lot (being a Japanese-American who was interned during WWII, losing two children), and was one of the strongest people I’ve ever known. So, despite (and perhaps, in part, because of) the fact that she wasn’t your typical grandmother, I liked her a lot. My maternal grandfather, on the other hand, was kind, gentle, soft-spoken, and quick with a smile. He taught me how to drive a golf cart when I was three years old–I sat on his lap and steered, while he worked the pedals. Whenever my family visited, he and I would eat breakfast (cereal with fresh blueberries) together while the others slept. Because of my grandparents, I got a little nostalgic reading The Thing About Luck . The book is narrated by Summer, a twelve-year-old girl, who is the daughter and granddaughter of Japanese-American wheat harvesters, who travel from farm to farm during harvest season. Summer’s parents have returned to Japan to care for some sick relatives, leaving Summer and her brother, Jaz, with their grandparents. Summer’s grandmother is a lot like Nana. She makes Summer and Jaz call her Obaachan (“’Obaachan’ [Grandmother] was more formal than ‘Baachan’ [Grandma], but it was what she wanted Jaz and me to call her”—a classic Nana move), and rides Summer mercilessly. She is harsh and mean and demanding and strict. But her grandfather, Jiichan (not the more formal Ojiichan), is a lot like my grandpa. He tells Summer and Jaz bedtime stories and reminds them: “You find magic everywhere, in wheat field, in mosquito, even here” (“in the town of Lost Springs, Wyoming, which had a population of four”). Obaachan and Jiichan had an arranged marriage and have been together over fifty years, and they gripe at each other incessantly. We got seven flat tires in six weeks. I got malaria, one of fifteen hundred cases in the United States that year. And my grandmother’s spine started causing her excruciating pain. Furthermore, random bad smells emanated from we knew not where. And my brother, Jaz, became cursed with invisibility. Nobody noticed him except us. This is a kids’ book. The reading level is very basic (AR level 4.7), so it’s one you can breeze through in a couple hours. But it tackles a lot of issues, including cultural differences, generational differences, anxiety (Summer has a pretty intense fear of mosquitos following her malaria), and autism (Summer’s brother has been to three different doctors and received three different diagnoses: OCD, ADHD, and PDD-NOS). It’s also an informative look at the life of traveling wheat harvesters (something I, for one, knew nothing about). The writing is smooth and easy, and the book is peppered with cute illustrations (Summer’s drawings of mosquitos and combines and such). I really enjoyed it, mostly because Obaachan and Jiichan reminded me so much of my own grandparents. But I gave it a 3.5, because I acknowledge that it would not resonate with most adult readers in the same way. But, if you have kids in the 3rd-6th grades (give or take), I would highly recommend it for them. Who should read it: Mom (i.e., people who will really relate to Summer); elementary school teachers (3rd to 6th grades) looking for a good read-aloud book or a book to recommend for SSR. 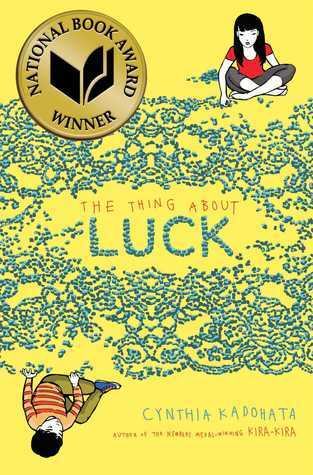 This entry was posted in Rating: 3.5/5 and tagged Book review, Books, Cynthia Kadohata, The Thing About Luck. Bookmark the permalink. Nicely written review. You should think about writing a book. Thanks, Ann. Glad you liked it. Everyone has thought about writing a book, haven’t they? The thing getting in my way: reading books is a lot more fun than writing them (and a whole lot easier) . . .